Brown's occasional papers trace a trenchant trajectory of learning from Las Vegas to learning from everything. A blessing accruing from many major architects having long lives is that they might get to enjoy the widespread acceptance and acclaim that was deserved in mid-life. Denise Scott Brown is an excellent case in point. After a recent ovation at Yale, and following critic Martin Filler’s New York Review of Book polemic as to why Brown, rather than Zaha Hadid, is the great woman architect of our time, Brown’s stature is finally approaching well-deserved Athena-like grandeur. Athena, let it be remembered, was the Greek divine symbol for feminine strength, strategy, and craft. Also notable was Athena’s uncanny ability to successfully collaborate with talented men. 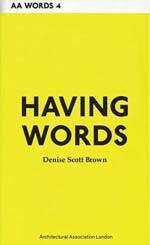 But bringing an all-so-human scale to Brown, London’s Architectural Association published a miscellany of her brief essays, really a handful of occasional papers written between 1969 and 2007. Brown characterizes Having Words as “cheap enough to be available to students and young architects and easily readable on the bus or in bed.” Don’t let packaging deceive. This is potent and deep material for all architects. Over the years, it has slowly dawned on me that the people who cause my painful experiences are ignorant and crude. . . .I have been helped to realize this by noticing that the scholars whose work we most respect, the clients whose projects most intrigue us, and the patrons whose friendship inspires us, have no problem understanding my role. Integral to her singularly crucial role within the Philadelphia-based firm of Venturi, Scott Brown & Associates has been her particular sensitivity to vernacular design as filtered through her youth in South Africa and Europe, and most crucially, her thorough grounding in linking design to a sociologically-sensitive vision of urban planning, Her insistences regarding the inextricability of top-drawer urban planning and design are particularly welcome in 2010. In this theory-laden time of contending “isms” among young architects and their teachers, in this vertiginous global economic and ecological climate, in this time of high-tech bacchanalia, Brown’s steady eye as urban planner-architect is stabilizing and inspiring.
. . . I have come to feel like architecture’s grandmother, a guardian of its institutional memory, who knows the pitfalls and where the bodies are buried . . .
What should we architects do when our brightest world leaders want to use challenge as opportunity? This can be an exciting time if we remember that smaller budgets call for greater imagination and tackling hard problems can produce brave architecture. Rekindling our 1960s concern for poverty and learning to use government effectively . . . are other challenges. So too is defining architecture as a wider window on a broader world than we had thought – but bringing to it well-honed skills, not rhetoric. These are sage words well worth having. Norman Weinstein writes about architecture and design for Architectural Record and The Christian Science Monitor, and is the author of “Words That Build” – an exclusive 21-part series published by ArchNewsNow.com – that focuses on the overlooked foundations of architecture: oral and written communication. He consults with architects and engineers interested in communicating more profitably. You can reach him at nweinste@mindspring.com. Selected essays by a penetrating sociologist of architecture pose the kinds of tough-minded questions needed now to keep architectural professional on-track. A helpful communications primer offers case studies of winning collaborations between clients and architects, but as useful as this book proves, it leaves some uncomfortable questions about communication unaddressed. A major architect in the history of Modernism finally receives recognition – and sundry asides about why Modernism never exited. To the credit of the erudite authors, their sketch of urban design brings levels of political, sociological, and architectural analysis together in a readable synthesis. Book Review: "Everything Must Move: 15 Years at Rice School of Architecture 1994-2009"
There’s a Texas flood of architectural ideas that gives ample evidence of an architecture school that unsettles pat assumptions. Who could ask for anything more? Supposedly architects don't need negotiating skills along with other communication skills because great design "sells itself." How lovely that an AIA legal counsel created this definitive book to shatter that thin myth. Sharpen your pencils - and get ready to do a NeoHooDoo shimmy.